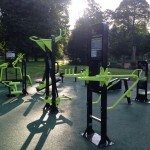 Ballymena has gained an Outdoor Gym located in the People’s Park. 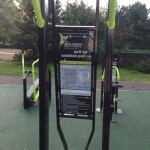 Near the pavilion the outdoor gym area has lots of different apparatus to help you keep fit and healthy! 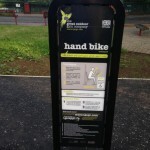 Each apparatus comes with clear instructions telling you what to do and exactly what part of your body you are working. 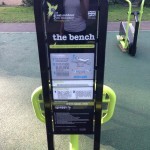 The bench is perfect for stomach crunches, the hand bike and fitness bike should cater for your cardio needs, work your arms and legs at the dips/leg raise area, and on the leg pull down! 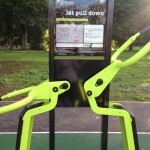 When we visited a group of teens were curiously investigating the outdoor gym and before long we were all joining in and egging each other along. Be careful to stick to the instructions and watch out if the equipment is slippery after rain showers. 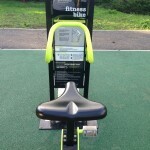 With the sun shining it was a great laugh and a good workout – best of all, it cost us nothing! 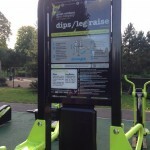 Next time we are out for a game of tennis or lawn bowls in the Ballymena People’s Park we stop by for a workout at the New Outdoor Gym.